Perhaps no onboard activity is as synonymous with Royal Caribbean as the surf simulator known as the FlowRider. When Royal Caribbean started adding FlowRiders to its cruise ships, it generated a lot of buzz and ever since then, the company has been working to add FlowRiders to more and more ships in its fleet. If you want to give surfing a shot on your next cruise, here is what you need to know about this popular surf simulator. The FlowRider is a simulator that sends water a very high speed across a small area that mimics what it is like to surf on the ocean. FlowRiders were first created as a business on land and have partnered with Royal Caribbean to offer guests cruising the chance to try it out there. The FlowRider supports two surfing styles: stand up traditional surfing and boogie boarding. 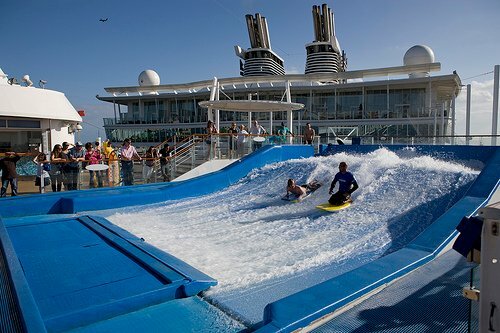 Which Royal Caribbean ships have a FlowRider? How much does the FlowRider experience cost? 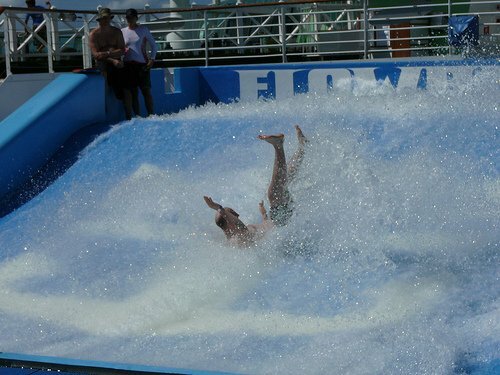 A ride on the FlowRider is included in your Royal Caribbean cruise fare. Guests can ride the FlowRider as many times as they like for free. They will simply need to wait in line for a turn. There is the opportunity to book private lessons for an additional cost. At last check, private lessons cost $60 per person and lasts about an hour. Each lesson will have six to eight guests. Private lessons can be booked onboard the ship and is sometimes available via the Royal Caribbean Cruise Planner. 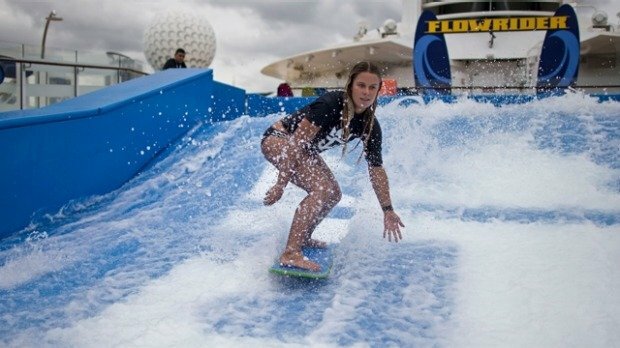 What are the restrictions for using the FlowRider? Guests participating in the FlowRider, for example, must be at least 52"/132 cm tall to use the bodyboard and 58"/147 cm tall to use the flowboard. Absolutely no footwear allowed, no goggles and no go-pro cams are allowed. As the cruise goes on, the lines for the FlowRider can get quite long. For shorter lines, embarkation day is always simple. Port days and morning sessions tend to be less crowded. Be sure to wear clothing that will not easily come off. The force of the water has been known to cause "wardrobe malfunctions". Women, especially, should consider wearing one piece bathing suits and/or t-shirts and shorts. Guests can surf until they fall off the board, but the staff is pretty good at challenging the talented guests in an effort to improve their skills and increase the likelihood of falling off. Check your Cruise Compass for session times. Often Royal Caribbean will offer special times for teens or adults. The sports staff is there for your safety and your assistance. Ask them for advice, especially if you are new. If you are stand up surfing, shift your weight to the back foot and never lift either foot off the board. If you are boogie boarding, keep your elbows in and keep most, if not all of your legs in the water.